Just saw Black Sabbath live in Amsterdam. Even if you’re not into hard rock/heavy metal, there are a few lessons to be learned here. 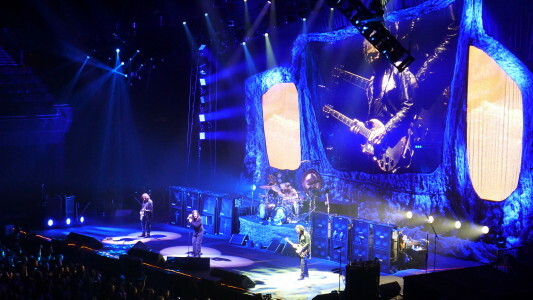 The Iron Men of Rock blew everybody away tonight, still playing monumental riffs after nearly half a century (!!!). The opening War Pigs (released in 1970 in the midst of Vietnam and the growing awareness of the atrocities committed in warfare) still rings timeless and true as did songs like Snowblind, Iron Man, N.I.B., Into the Void, Dirty Women and many more. These are legends, heroes and inspiration to many through nearly 4 decades of rock. Tony Iommi’s uber cool inspiring awe with his heavy riffs, without getting into any of the overly technical soloing that a lot of guitarists use to impress. Vibe, mood and sending out subsonic waves straight into the bone of their audience, that’s what Black Sabbath’s approach has always been. 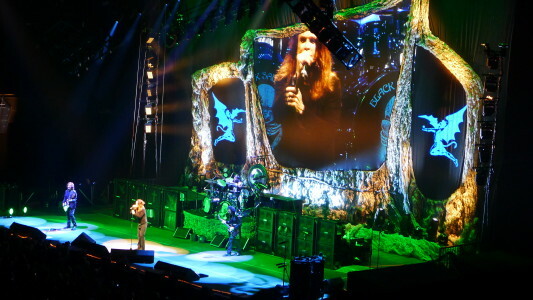 Ozzy’s odd high pitched deliverance adds the treble narrative to Geezer Butler’s thundering bass, rolling through the arena like an avalanche of epic rocks from the age of giants and dinosaurs. Too bad Bill Ward was not on drums as his replacement did an adequate job, but lacked that extra power swing that Ward (like Butler, traditionally a jazz musician) brought to the mix. 1) How much this music is encoded into the DNA of myself, my friends that came along (Malcolm and Fedor were pioneers themselves back in 1986/1987when they still lived in Suriname and co-founded Allegro Fortissimo, the first heavy metal band in the country) and countless musicians including Metallica. The intensity and narrative within the riffs is truly ageless, an undeniably mountain in the cultural landscape of the 20th century and beyond. 2) Legacy. This band’s first 6 albums are so packed with classic songs and recognizable lines that it’s hard to imagine modern rock without its influence. If I can emulate a fraction of that quality and originality in my fiction with a few good books and other forms of narrative, I can die a happy man. 3) The Power of Darkness. The great thing about Black Sabbath is that the music is ominous, heavy and dark, yet never gives on a negative impression of wallowing in angst and depression. It is a courageous confrontation with the forces that exist in the modern world, this is the Blues in super slowmo, poured into a T-800 type bulldozer and revelling in its exploration of the dark recesses of humanity (note that this was not the music one expected in the flower power post-Beatles era). The wings of doom are not there to fix one in the madness and absurdity of our existence, but to confront, understand and ride the waves with a paradoxical sense of joy and elation that such art can bring. Catharsis and empowerment. When these intense feelings of confrontation and courage that humanity can aspire to are expressed and materialized into art forms the latent energy is manifested, given a voice. And this is why Black Sabbath’s music is timeless, they didn’t just write songs. They created sonic monuments that receive and transmit the power and heaviness of the universe. Heavy sonic monuments that still stand tall in the musical landscape of the 21st century. Timeless, ominous and uplifting. ChecWherever I go, their bass rings in my head at unpredictable moments. And I’m certainly not alone in this.